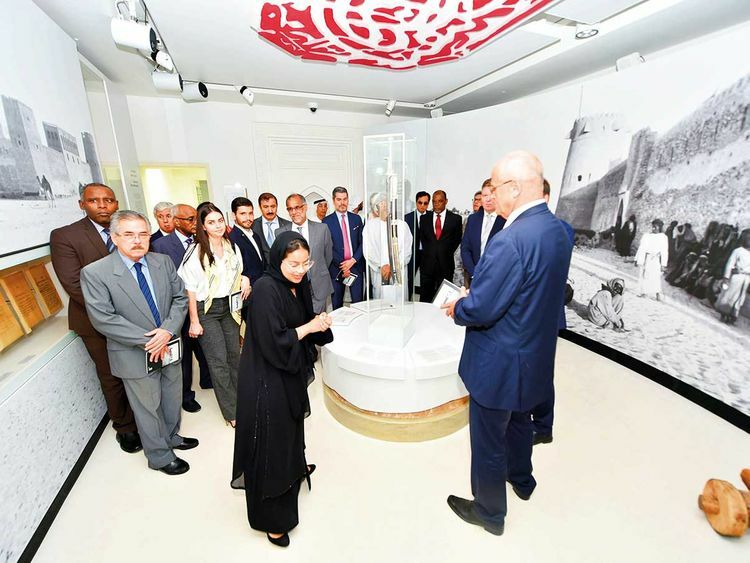 Abu Dhabi: Touring Abu Dhabi’s oldest historical landmark, foreign ambassadors to the UAE called for global unity and cultural understanding between different nations, faiths and peoples to counter the voices of hate and intolerance. Organised by the Ministry of Foreign Affairs, the dignitaries representing dozens of countries were guided around the Qasr Al Hosn fort on Tuesday as they were given insights into the capital’s oldest standing building and the fort’s role in witnessing the evolutionary growth of Abu Dhabi. “Qasr Al Hosn as a fort speaks to the story of the beginnings of the island of Abu Dhabi, an island which has evolved into this beautiful gem — one of the capitals of the world,” said Saif Saeed Ghobash, undersecretary at the Department of Culture and Tourism Abu Dhabi, welcoming the ambassadors to the site. “Qasr Al Hosn witnessed the first forms of what would be referred to today as a centre of government in Abu Dhabi, this is where key governing decisions were taken, and this is where the government interacted with the multiple facets and parts of society,” he added. “So it is only fair that today we ask you diplomats, representing and owning the responsibility for dialogue between the UAE and your respective countries to come in and see one of the places where the history of diplomacy started in Abu Dhabi,” Ghobash said. Navdeep Suri, the Indian Ambassador to the UAE who was among the touring delegation, said there could be no complacency when facing intolerance, and went on to praise the UAE’s Year of Tolerance initiative. “I believe that in this Year of Tolerance, it is important we get to know one another because I strongly believe that the atmosphere of hate, paranoia and uncertainty stems from a lack of knowledge and understanding of the other. “In the current climate that we are in it’s very important to push for these kind of things and I must commend the government of the UAE for raising such initiatives. The UAE recognises that we cannot afford to be complacent and just let things drift and hope for people and countries to adopt the spirit of tolerance,” he added. “We need to proactively promote these concepts so that they become entrenched in our societies. The signing of the document of human fraternity during the visit of Pope Francis is an embodiment of that proactive approach to take the tolerance agenda forward,” he said. Francisca Elizabeth Mendez Escobar, Mexico’s Ambassador to the UAE, said that living in a globalised world made it all the more important for cultural dialogue. “We are living in a global world, so the things that happen in one country whether it’s in Mexico, UAE, Latin America or Asia can have an impact globally. “Everything is connected today, and so I believe that it’s very important to understand each other especially in a global world. For me as the Ambassador to Mexico, I see it as my responsibility to learn about the amazing culture of the UAE and visits to beautiful sites like Qasr Al Hosn is part of that process. It’s a great opportunity to build better relationships between the UAE and Mexico when it comes to culture,” she added. Ambassador Deng Deng Nhial of South Sudan, paid tribute to the UAE government for creating a Ministry of Tolerance, calling it a unique example for others to follow. “No country in the world has a Ministry of Tolerance, and this comes as a result of the late Shaikh Zayed Bin Sultan Al Nahyan, the founding father of the UAE and the foundations he built. “We are all created equal in the eyes of God, and so we need to learn and appreciate each other as human beings. Sharing our cultures and having tolerance for one another’s religion, history and customs is critical,” he added.